Peter Robinson on the Durban climate talks and the challenges facing climate activists. Scientists have forewarned for a long time that global warming would be accompanied by a breakdown of normal weather and that we would see more and more extreme fluctuations. Many of us in the UK are cocooned from what is happening by our central heating and may find it difficult to attribute exceptional and unpredictable weather changes to climate change. We soon forget the freezing weather we had this time last year, or the rather warm autumn, and the flooding in summer 2008. We brush off the fact that this year was the deadliest ever in the tornado belt in the USA – 753 twisters in April alone. The flooding in Pakistan and Australia was also unprecedented, that in Australia covering land three times the size of the UK. I recently went to Durban, South Africa to attend and demonstrate outside the United Nations Climate Change Conference (COP17 for short). I spoke to many people and although there are no words for climate change in Xhosa or Zulu, what they had to say was disturbing. People told me “We used to be able to read the skies”; “the seasons have changed”; “our ancestors have always lived here but the rain now falls on the other side of the mountain”. One of my contacts in South Africa was Bandile Mdlalose. She is general secretary of Abahlali baseMjondolo, a shack-town dwellers organisation, representing 64 ‘informal settlements’, mainly in and around Durban. Bandile took us around the Kennedy Road shanty town, just a few kilometres away from the talks where the delegates were meeting in rather more salubrious conditions. The morning the COP17 conference started there were exceptional sub-tropical storms. At 5am a couple of the shack homes were swept away in the Kennedy Road settlement. I met one former owner and she told me that when the emergency services did eventually arrive they gave her a blanket and a tin of baked beans. That was it. I don’t know if this victim linked the storms to climate change, but others from her settlement were amongst those demonstrating outside the climate talks. In all 11 people in the region died that weekend from the rains. These people who live off the land and in the shanty towns are our climate antennae. Those of us who went over to the talks in Durban feared the worst. The pundits said nothing much would emerge. Presidents and prime ministers from the major nations stayed away, with the exception of South African president Jacob Zuma, who had little choice. He opened the conference with fine words: “For most people in the developing world and Africa, climate change is a matter of life and death… In these talks, states, parties will need to look beyond their national interests to find a global solution for the common good and benefit of all humanity.” But how much progress could we expect from the person who had the year before sanctioned the world’s biggest ‘dry cooled’ coal fired power station at Medupi, on South Africa’s northern borders. For the record, South Africa’s CO2 emissions are higher than those of the UK, while its GDP per head is only a sixth as much, and it is responsible for two fifths of Africa’s CO2 emissions from fuel burning. Given the backcloth of hypocrisy and our low expectations it was perhaps a surprise that the COP17 was not a complete debacle. After the Copenhagen and Cancun UN climate talks, when voluntary deals were struck that were not legally binding, it seemed implausible that rich and poor nations would one day strike a deal. After much wrangling, and the talks were extended by two days, the world governments collectively committed themselves to writing – over four years – a global agreement to reduce greenhouse gas emissions. The outcome only arose because of massive concessions by China and India in particular. In essence this reverses the Chinese opposition from Copenhagen. Yet while ministers were fiddling at the talks the planet continues to burn. Remember that last year some 200,000 people died (and that is a conservative estimate) because of climate change, more than all of those killed by wars. This number is going to increase every year, sometimes exponentially, and will lead to massive migration accompanied by xenophobia and more war. Very few people now say that it was possible to restrict global warming to two degrees over pre-industrial levels, thereby leading to climate catastrophe. Another reason that some people may find it hard to focus upon climate-related issues is because of the current highly insecure economic situation. The over-riding argument put out by the industrial nations, that there is no money to combat climate change, is both not true and does not make sense economically. George Monbiot points out that by March 2009, the US Federal Reserve had committed $7.77 trillion to the banks. That is just one government’s contribution, yet it amounts to 12 times the annual global climate change bill. On just one day the Federal Reserve made $1.2 trillion available – more than the world has committed to tackling climate change in 20 years. To quote the Conservative MP Tim Yeo, it is as if government has decided to cut investment in building spitfires at the outbreak of the Second World War. To me, the richest nations who called the shots at the Durban conference have cynically delayed putting off any actions so that they can protect their own interests. The political will is not there, as yet. But things can be changed. Durban was inspiring, not just because of the meagre progress that was made in the talks, but because I saw people making the connections between their own and the struggles of others, and making the connection with climate change. An alternative People’s Space was set up at the university where every day hundreds and even thousands of people were involved in meetings and workshops and other events. In addition there was a symbolic ‘occupation’ outside the conference. These events became the organising hubs for a number of demonstrations, protests and other activities. Mid-way through the conference, on December 3, an estimated 12,000 people from all Africa, indeed the world, marched outside it. Among those demonstrating, indeed singing and dancing, outside the conference was Zandile, who lived in a slum outside Johannesburg. She was among a group of women who had travelled for 17 hours by bus to be there. Members of her community were fighting for a decent a regular electricity supply, trying to stop Eskom, the state-owned electricity provider, from forcing residents to buy electricity in advance and at exorbitant rates. Zandile told me she was both a communist and a lesbian, and the group she came with were actively organising against rapists. Zandile told me about the flooding, and how it was impossible to do anything when the mud came up to her knees. One of the features of the march on December 3 was the number of trade unionists and others wearing either the SA campaign T-shirt (‘Cool it with Climate Jobs’) or the National Union of Mineworkers T-shirt (‘Create and Retain Climate Jobs’). The following day the South African million climate jobs campaign held a one-day conference. The South African campaign has very wide, and active, backing from unions and environmental organisations. They produced a report setting out the possibilities for one million climate jobs now. The conference room held 400 people, and at times was almost full. Probably 500 attended over the course of the day. A bit under 100 were foreigners. Of the South Africans, the majority were workers, unemployed, or poor rural women. The conference was covered on the national TV news, with Philip Pearson of the TUC one of the main people explaining climate jobs to camera. On December 6, climate activists went on a ‘toxic tour’ to an industrial zone in South Durban and demonstrated outside the Engen refinery, responsible for enormous amounts of greenhouse gas emissions, accompanied by all sorts of poisonous fumes. There is a suspiciously high incidence of blood and lung cancers. 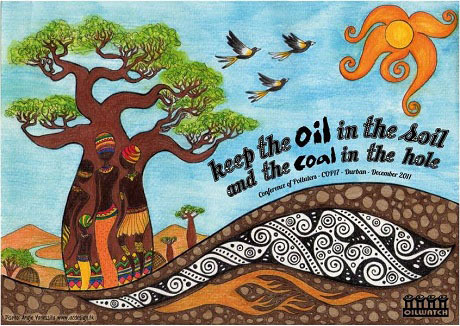 So bad is the place, and so worried were the authorities, that the refining was stopped for the whole of COP17. When a fire broke out on October 10 at the Engen refinery, a hundred children from the nearby primary school were taken to hospital. Children at this school have the highest recorded rate of asthma in the world, some 52 percent. One child was admitted to hospital for 5 days, and is now diagnosed as an asthmatic, possibly for life. The mother was given 30 rand (just over £3) compensation and a carton of orange juice. Durban brought together sections of civil society, such as the waste pickers, people from the shanty towns, from the ‘food sovereignty’ movement, trade unionists, people from the churches, environmentalists, and even businesses, linking the dots to climate change. I was born in South Africa, and left for the UK, in 1961, in my teens after my parents were imprisoned during the 1960 emergency for opposing apartheid. At the time very few people thought it was possible to overthrow apartheid. It took many years for the world to realise how unjust apartheid was. At some stage it was necessary for the United Nations to pass resolutions condemning apartheid. In the end the apartheid regime was overthrown by a mass movement, bringing together different sectors and employing an enormous range of tactics. Durban showed me that a political and social movement is emerging with regards to climate change, and not just in South Africa, like that which led to the overthrow of apartheid.